This trail joins all the Maritime provinces with Québec, New Brunswick and the State of Maine in the United States. 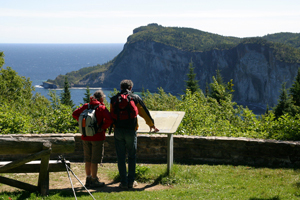 The Québec portion, 650 kilometres long, starts in Matapédia to ends at Cap Gaspé in the Forillon National Park. Discover hiking suggestions, guided packages and services offered to hikers, for short or long hikes, in collaboration with several partners along the trail.